As the post below from back in August of 2010 points out, most years I struggle with the month of August and this particular one is no different. The doldrums set in and I am filled with an anxiety and a stifling restlessness that combine to create a sense of desperation within me. If I hadn’t experienced this before, this feeling would seem unbearable. But it’s not something new so I realize that it’s just a matter of hanging on and letting it pass, all the while trying to pull something from it that will show itself in my work. I have found that such keen desperation is often the source of great work, much as playwright August Wilson —a fitting first name!— points out so eloquently in the quote above. So, while I find myself fighting through the cruel days and demons of August, I do so as I listen for the song of angels to begin. And from experience, I know they will begin soon enough. Sing, angels, sing! 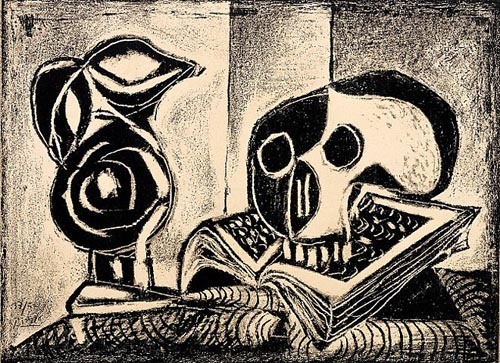 This print from Picasso [ Above] very much sums up my feelings for the month of August. I have never been a fan of August. Memories of the so-called dog days of summer spent as a child. Hot from a relentless sun. Bored. Burnt grass crunching underfoot. The coming school year hanging overhead like the sword of Damocles. August has always had a faint aura of death around it for me. I remember the death of my grandfather in ’68. My beloved dog Maggie years later. Several friends over the years, from a variety of causes. Elvis. The bright glare of the August sun seeming to taunt the grief of the moment. Fascinating. Thank you! Your reflections give context for my mood as well these days…. I am sure there is a community of us somehow resistant to the charms August might offer. I could offer an alternative perspective as I TRY to put a positive spin on each day…. by Lawrence Durrell, found long ago above the masthead of the (Martha’s) Vineyard Gazette….”Easy to be patient in the summer. The light running like fishes among the leaves, Easy in August with its cones of blue Sky…” Maybe we just need to keep looking up! Say “August” to me, and all I think is heat, punctuated by storms. It’s so hard to force myself to work when the mornings are uncomfortable, and the afternoons impossible. August for me is all longing: mostly, for September. It’s the paring process we long for, I think. The “dog days” (from Sirius, the Dog Star) of August are the depth of the summer, the hottest part of the year, the time that presages the harvest. The grasses seed and die — wheat, oats, rye, rice ripens. Fruits and vegetables are ripening. The frantic activity of the harvest is impending. The dog days are the “hump” of summer. From there it’s all downhill to winter, and the hard climb back up to spring The city is simply too hot. Everybody who can leave, does. Paris virtually shuts down in August.. My brother and my dad were born in August, and my mom was born in September — as bad as the August heat is, imagine having to go through that heat while you’re in the final months of pregnancy! I am not going to even try to imagine, thank you!